>>> Andy applied for a diabetic service dog in April of 2014. In September 2014 he was approved and we took a road trip to a place called Freedom Paws in Marysville, Ohio. Freedom Paws is a Non Profit Organization that trains all kinds of service dogs. The trip in September was wonderful. 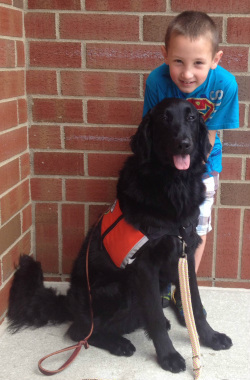 Andy took a week of classes teaching him how to be a diabetic service dog handler. They taught him not only the commands and how to continue the training at home, but also facts in general regarding service dogs and their behavior. They informed him on their grooming and health needs, and how to teach them new commands which can be useful to Andrews situation. Andrew practiced with different dogs that they had available to see which dog responded best to Andy and his personality. And by the end of the week Andy was certified and matched to our newest family member Rio. >>> These dogs have been trained to detect both low and high blood glucose levels and alert their owner. Since Andy and Rio have been together, Rio has alerted him many times before Andy even knew there was a problem. Rio has woke Andrew up in the middle of the night to let him know his sugar was getting dangerously low, but in plenty of time for Andrew to resolve the problem without calling 911. Rio is truly relentless and will not let Andrew ignore him when he is alerting him. These dogs are truly amazing. Rio is by Andrews side day and night. Rio gives Andy a sense of peace and independence that he has never had in his life. >>> Andy and I both were very impressed by Tera the owner of Freedom Paws and the way she operates this non profit organization. Andy had one on one training with Tera. She was so thoughtful toward Andy, taking as much time as needed for Andy to understand everything that he needed to learn. 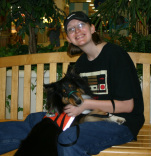 Her knowledge regarding diabetic service dogs and her organization was remarkable. I will never be able to thank Tera enough for what she has done for Andrew. He can finally feel like everyone else, free to go out places and do anything he wants, because he knows Rio is by his side and will alert him as soon as Rio senses rising or dropping glucose levels. I have been privileged to have Nashville as my Diabetic Alert Dog since April, 2016. We have been able to go to Cleveland, Barnesville, Wooster, and East Liverpool for visits with no problems. While we were in Cleveland we had to go to the VA Hospital to assist with taking care of my brother. We were in a strange environment with numerous strange people coming into Pat's (my brother) room and Nashville was still alerting me when my blood sugar dropped below 100. There have been times when I am sitting at home and he will be in the bedroom and he will come up to me and start nudging my leg. I will feel fine but I always listen to him and go check my blood sugar when he alerts me. He has never been wrong. I started this story telling you where we have travelled because before I got Nashville I could not drive more than 20 minutes from my home. You see I have hypoglycemia unawareness. And now that I have Nashville I can travel with no fear of becoming a danger to myself or others on the road. Nashville alerts me whenever my blood sugar drops to a level predetermined by my Endocrinologist. So I am living again and doing some short trips. Nashville is an absolute God-send to me. And I feel so grateful to the marvelous staff who had trained him to be able to take care of me. We go every where together. My sister tells her kids that Nash is the best behaved member of our family. There was one day that I was doing some yard work in the Nash was on the other side of my back yard chasing a rabbit. He stopped dead in his tracks and came over to me because my blood sugar had fallen. The reason I mention this is because even when he is not right by my side and appears to not be paying attention he still senses when I am dropping.